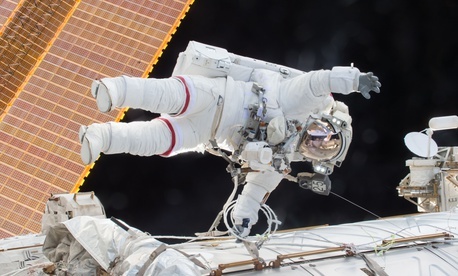 Given the lack of gravity, personal space, or guarantee of surviving any given day, one would think space stations would rank among the more stressful, conflict-ridden workplaces. But according to retired US astronaut Scott Kelly—who spent 520 days in space over four different missions and was commander of the International Space Station during his final, year-long tour—working in space is pretty chill. “It feels like when you wake up, you’re at work, and when you go to sleep, you’re still at work. It feels like you’re living in your office,” Kelly said in a recent interview with Harvard Business Review’s Josh Olejarz. “But it’s an incredible office. Right? It’s got an incredible view. Astounding as “almost no conflict in space” sounds, the notion of a drama-free workplace seems far more tenable (even without an office psychologist) when you consider Kelly’s leadership tactics and his coworkers’ team-first focus. Maybe your day job doesn’t help you feel like a goodwill ambassador or an extension of civilization. But the fundamental values bonding Kelly and his team—of doing something challenging, together—are easily relatable. Like most people, Kelly didn’t know the majority of his coworkers personally before working (or, in his case, flying) with them. Instead, they honed relationships by being vulnerable about the challenges and risks of their profession, and grateful for the opportunity they shared. One would think that directing the International Space Station or flying a spacecraft would demand tight-reigned leadership at all times. Kelly, however, took a more flexible approach. As he told HBR: “If there’s a fire on the Space Station, my leadership style is those of a tyrant: Tell people what to do, and I don’t want any questions.” But in other circumstances, he was more collaborative—and at other times he would delegate. Kelly’s situation-based leadership style demands a blend of confidence, self-awareness, and humility. By setting clear guidelines when times get tough, you help your team trust you, and one another. And when there’s no single solution to a problem, by acting as an equal, intent on learning from your team rather than imposing your own views, you foster innovation and mutual respect.